Eritrea was part of the first Ethiopian kingdom of Aksum until its decline in the 8th century. It came under the control of the Ottoman Empire in the 16th century, and later of the Egyptians. The Italians, with the consent of the British Goverment, captured the coastal areas in 1885, and the Treaty of Uccialli (May 2, 1889) gave Italy sovereignty over part of Eritrea. The Italians named their colony after the Roman name for the Red Sea, Mare Erythraeum, and ruled it up until World War II. The British recaptured Eritrea in 1941 from the Italians and later administered it as a UN Trust Territory until it became federated with Ethiopia on Sept. 15, 1952. It was made an Ethiopian province on Nov. 14, 1962. A civil war broke out against the Ethiopian government, led by rebel groups who opposed the union and wanted independence for Eritrea. Fighting continued over the next 32 years. The modern state of Eritrea gained its independence from Ethiopia following a thirty year war which lasted from 1961 to 1991. Eritrea's constitution adopted in 1997 stipulates that the state is a presidential republic with a unicameral parliamentary democracy. But the constitution was never ratified and since the outbreak of hostilities with Ethiopia in May of 1998, the country is under a de-facto state of emergency ruled by presidential decree. Eritrea is a multilingual and multicultural country with two dominant religions and nine ethnic groups. The country has no official language, but it has three working languages: Tigrinya, Arabic, and English. The first Greeks arrived in Eritrea in the mid 19th century travelling through the Sudan and Egypt. In the town of Keren, VLASSIS FRANGOULIS established a small Community. 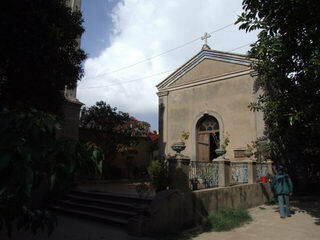 The small church of St.John and the elementary school which were built then, are still maintained today. During the Italian census of 1894, there were already 178 Greeks living there. 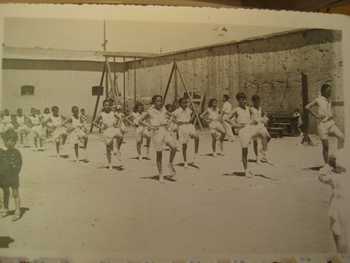 The Greek community of Eritrea, with a history of about 100 years, was at its peak during the first decades of the Italian invasion and at some stage it reached approximately 400 people. Even during the Fascist regime there were no clashes though many Greeks were rounded up and sent to Quoran in a concentration Camp. When the British took over the administration of Eritrea in 1941 they brought with them some high Greek Cypriot officers who, owing to their language and religion helped a lot of Greek families. 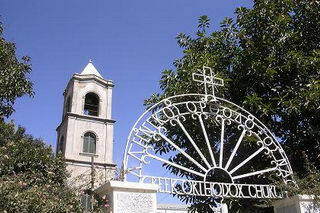 The first Greek Community of Asmara was founded in 1900. On the 14th January 1905 the first 'Constitution' was composed and on the 16th March 1910 this was officially recognised by order of King George 1st. This 'constitution' was then further ammended by a general meeting on the 21st August 1919 and approved by a new order on the 24th July, 1920. 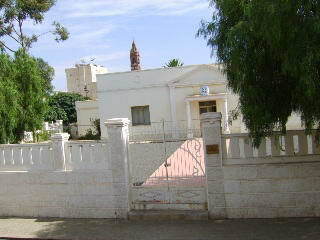 The Greek Community of Asmara was under the dependance of the Greek Embassy in Addis Abeba. From Keren was also a Greek called VASSILIS SPYROU. 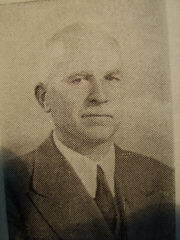 Little was known about him until recently, but following research published in a book called The Greek prisoners of Dachau, it appears,Vassilis Spyrou was one of the many Greeks who were imprisoned in Dachau during World War II. The story of Vasili Spyrou starts just before the start of the war declared by Italy against Greece in 1940 which lasted up to the end of the war in 1945. Vassilis was born in Keren on the 12th October 1917 son Emmanuel, a Greek from Rhodes and an Eritrean mother. As an Italian citizen (The dodecanese were under Italian occupation), he was called up in the Italian army where he started as plain soldier and went on become a Corporal. During the Greco-Italian war he was fighting for the Italians in the Albanian front and was captured prisoner. Being Greek too and anti fascist, after the German invasion of Greece he was captured by the Germans and sentenced to death, but recalling his Italian nationality he managed to avoid his execution and was deported to Rome instead where after the fall of Mussolini he was sent together with many other Italians to the famous concentration camp in Dachau in October 1943. He was one of the lucky ones to survive and was freed by the Americans on the 29th April, 1945. Following his freedom, hand written newspapers were published. One of them was called .. 'Free Dodecanese'.. in which Vassilis contributed with many articles. One of these was called .. 'Memories of Greek Life in Asmara'..
ELIAS LENGAS, established his business in 1887. He was an Importer/Exporter, General Merchant, Commission Agent as well as a Shipchandler. He had offices in Asmara and Massawa and was one of the older Greek migrants of Eritrea. He was involved with the community and served his term as 'chairman'. 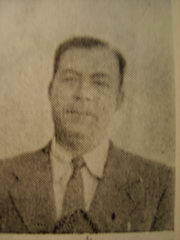 D. SOUVLIS,was the Founder of the famous DONGOLO WATER FACTORY.He arrived in Eritrea in 1912. His products were sold throughout Eritrea. He was an outstanding member of the community and served as a 'chairman' for a while. From 1942 to 1949 a lot of businesses flourished and the Greeks with commerce in their blood did pretty well, without upsetting any of the other societies around them. Greeks such as the DERVINIOTIS, PAPPAFILIPOU, APOSTOLIDIS, BOURBOULIS, ZECOU excelled in commerce and became great benefactors to the local community. The young Greeks excelled in Sport too. In Basketball great players such as FRANGOULIS, TSAKONAS, BOURBOULIS will be remembered by many as simply the 'Best'. PRAXITELIS KYRIAKAKIS from the village of Melitini in Sparta was one of the more famous Greeks who lived and worked in Eritrea. He travelled widely throughout the country, engaged in business, run a Restaurant, a soft drinks factory and various farms. Another Greek pioneer was called COSTIS MANOLARAS. He arrived in Eritrea from Rhodes in the early 1900's and worked as a labourer. During his life in Eritrea, he did many different jobs but finally he settled down in a little village on the borders of Eritrea and the Sudan, called Tessenei. There he run a Hotel and Restaurant and it was very popular with people transiting between the two countries as well as Italian truck drivers transporting mainly bananas and other goods to the mainland. He run the Hotel until the early 70's but then he returned to Asmara where he died in 1973. Costis left a son called Dimitris who first went to the Greek Community School in Asmara, then he went to Comboni College in Khartoum. He worked in the Commercial Bank of Ethiopia for many years in various posts and finished his career as a Branch Manager. 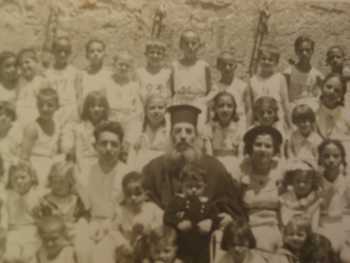 In 1958 he married in Rhodes Stamatia Karavasilias and had two boys Costas and Yiannis who started their education at the Papaphilipios Elementary School. After completing their higher education in Addis Abeba they continued their studies in Greece, where they graduated. ORESTIS STYLIANIDIS from Rosopouli in Lemnos arrived in Massawa in 1910 at the age of 14 to join up with his brother THEMISTOKLIS who owned his Tobacco Factory. They were producing their own cigarettes with a blend of local tobacco and tobacco imported from Gravenna (in Greece). When Themistoklis decided to return to Lemnos, Orestis carried on the business until 1936 when the Tobacco Industry was monopolised by the Italians. Orestis went on to open a large retail shop called 'La Bottega Orientale' in which all sorts of wares could be found from Musical instruments to shoes and other curios. In 1935 he was joined by his brother in law from Moudros PERIKLIS MACRIDIS who lived in Massawa until 1952 when he died of Diabetes. Orestis was also running a small Hotel in Asmara called PENSIONE KALLITHEA which was family run and favoured by families from the Sudan. Asmara had good hospitals, doctors and all sorts of Medical facilities and people used to come to Asmara for medical treatment.The Greek presence in Eritrea survived both the Italian war era of the 1930 as well as the period that followed it when the country was placed under the protection of the British (1941-1952) and then its amalgamation and subsequent annexation with Ethiopia. Almost at the same time Fotios Pagonis born in Kefalonia (an island in the Ionian Sea) in 1915, was making his way to Massawa after a brief stop at Djibouti in the year 1925. There he opened the 'Ristorante Maria' which was situated opposite the Panna grocery and next to the Derviniotis complex. On the first floor there was a 'billiards' room and a Cafeteria which was visited by the crews of the warships arriving from Italy on their occupation advances. Fotios married Maria Christoforakis and from his marriage he had six children. 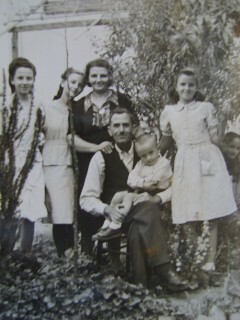 Spyros, Archondoula, Vangheli, Annoula, Nikola and Markella. 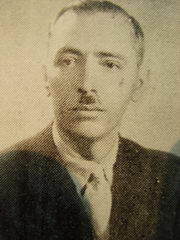 APOSTOLOS PAPAPHILIPOU, arrived in Eritrea from Rhodes (Lindos). He establsied G.Myriallis and Co. in Eritrea dealing with Imports, Exports. He had a Tannery for Leather which he exported worldwide. He was appointed Honorary Consul for Belgium. In the community he had the highest esteem. 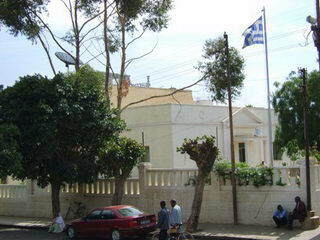 He donated the 'Papaphilipios School' which today houses the Greek Consulate of Asmara. A man of great personality and an even greater charitable heart! School taught strict discipline but above all exercise of body and mind! 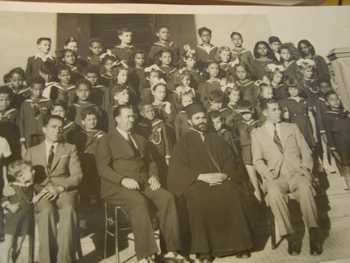 Another school picture of the 30s. 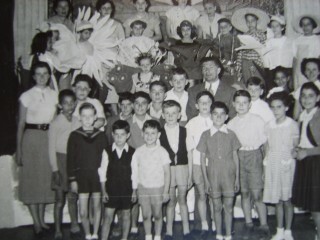 School plays involved the whole community. 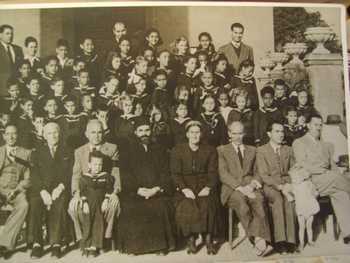 Here with teacher Vassiliadis when the school was at what then bacame the CUA Club. 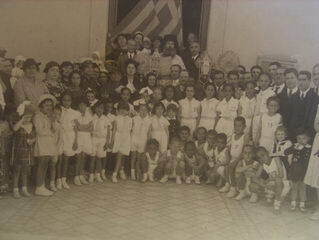 Seen are the school children of the Greek Elementary School and the older members of the school who helped to prepare the stage and outfits. 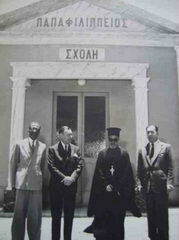 Standing proudly in front of the School Savvas Derviniotis, Apostolos Papafilipou and Father Varzos. Standing proudly in front of the school..three graduates of 6th Elementary year 1958. 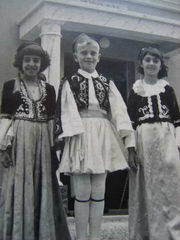 Evanghelia Filis, Costas Stylianidis and Kaiti Mousakiotis. During the decade of 1970 when Emperor Haile Selassie of Ethiopia was deposed (1974) and the country underwent major political and economic changes, the Greek Community, as well as the other foreign communities suffered a major decline and some almost disappeared. Today, due to the improved conditions the Greek Community counts about 30 individuals. 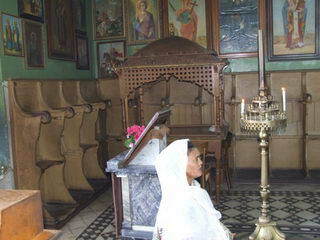 In the capital Asmara, there are about 20 who centre around the Greek Church of the 'The Evangelistria'. In the old days Asmara was priding itself of the 'PAPPAFILIPIOS SCHOOL' and the 'DERVINIOTIOS CLUB' donated to the community of the time by the great benefactors whose names they carried. 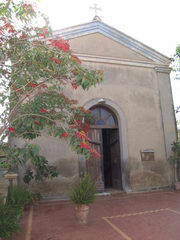 Today the 'Pappafilipios School' houses the Greek Consulate.In the little town of Keren, centre to the fighting of the Eritrean war of independence, very few Greeks survive, but they still maintain the Church of 'John The Baptist'. 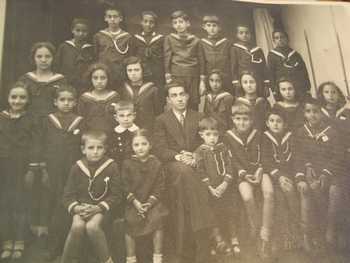 In the early 20th century the Greek Community there also maintained a Greek School. 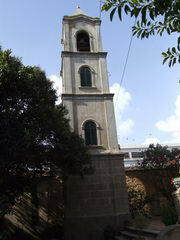 These churches come under the umbrella of the Patriarchate of Axum. A considerable Greek presence also existed in the port of Massawa . The Greeks of Eritrea were mainly from the Dodecanese Islands and Keffalonia. There were Greeks in Tessenei, in Agordat. An unforgetable character was a Greek from Asia Minor called 'Barba Stellios' also known as 'Barba Fiaka' who used to roam between Om'Hager and the natural hotwater springs of Ailet and whom many people will remember for his endless jokes especially of 'Stratihodgia' and of course, of his infectious laughter! He used to be ferried every year by an Italian friend called Conte Marazzani who had agricultural land in Adi Ugri and who, religiously, every year, until the latest years of his life, would do the long drive from Om'Hager to Ailet at the begining of the season and all the way back at the end of it. In Om Hager Barba Stelios would set up a makeshift restaurant to care for truck drivers stopping for the night rest. His speciality was 'Capretto a la Dancala'. He did the same thing at Ailet where people suffering from Rheumatic pains would go for a few hot spring baths. He pitched his restaurant on the banks of thedry river in which the hot shallow springs were dug. There, in a row of mud huts, dimly lit by primitive looking oil lamps, the air was always full of the infectious laughter and the memorable jokes of 'Barba Stelios'. Greek Asmarinos who left Eritrea have established themselves successfully, all over the world. Who would have thought however of a Greek in China. Indeed, Bill Apostolidis did exactly that! Since 1987 he went to Beijing and now is the Director of one of the biggest Burner factories in the world. Here, he is seen with successfull and pleasant Team in 2006! Well done Bill... you make us all very proud!